Education Days are two of the biggest days of the season for the Stockton Ports, Single-A Advanced affiliate of the Oakland Athletics, but this year they were bigger and better than ever. 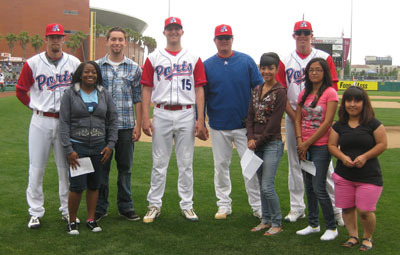 This year, the Ports Education Days were held on May 11 & May 23, both 11:05 AM day games. A total of more than 50 different schools attended the Education Days. Each child and teacher received a $6 package that included a ticket to the game, a hot dog, chips and a drink. Not only do schools use these days as an end-of-the-year field trip, but the students have a chance to interact with the players, as well as learn new things about baseball. Before the games on May 11 & May 23, four students were chosen to ask Ports pitchers Josh Lansford, Gary Daley, Jr., AJ Huttenlocker, Chris Mederos and Scott Deal educational questions down on the field in front of the crowd. Afterwards the students were able to get autographs from the players. During each game, students were randomly chosen to be a guest PA announcer, Radio announcer, to throw out the ceremonial first pitch, as well as start the game as our Play Ball Kid and to lead the crowd in “Take me out to the Ballgame”. Stockton’s very own 6-year-old super star Kayla Talania from Creekside Elementary blew the crowd away with her version of the national anthem on May 11. Sisters Micah & Grace Ann sang for the crowd on May 23. Clifford the Big Red Dog from Barnes and Noble was at both games, as were many local businesses promoting their education programs including Sylvan Learning Center and University of the Pacific. For more information on the Ports Education Days, contact (209) 644-1900. Ports pitchers Chris Mederos, Scott Deal, Josh Lansford & AJ Huttenlocker take a picture with students from Carroll Fowler Elementary School after the pre-game educational Q&A on the field at Banner Island Ballpark. A 6-year-old Kayla Talania belts out the national anthem during Education Day. The Staten Island Yankees helped support the Staten Island Children’s Campaign by hosting a fundraising event on May 22, 2011. The fundraiser was held both inside and outside of Richmond County Bank Ballpark, gathering the community together in an effort to support the local non-profit organizations of Staten Island. Touch-A-Truck events take place throughout the country and allow children to participate in a fun-filled day of exploring and learning about their favorite trucks and other vehicles. Guests were allowed to climb inside, honk the horns, sit in the passenger seat, and take pictures with the twenty plus trucks that were located in the parking lot. While the trucks and majority of the event took place in the parking lot, other events such as face painting, tattoos, coloring, tug-of-war, water balloon toss, and the excitement of inflatable’s were held on the field and were enjoyed by kids of all ages. The Staten Island Children’s Campaign is a charitable trust sponsored by the Staten Island Advance to raise funds for 17 non-profit organizations that provide educational, health, recreational, and counseling services to 60,000 underprivileged children on Staten Island. Every dollar raised by the campaign is equally distributed among the following groups: American Cancer Society of Staten Island, Catholic Youth Organization, Camelot Counseling Center, Children’s Aid Society-Goodhue Center, Community Resources, Geller House-Jewish Board of Family & Children Services, Grace Foundation, Have a Heart Foundation, Jewish Community Center, the Mission of the Immaculate Virgin at Mt. Loretto, Project Hospitality; Seamen’s Society for Children and Families, Staten Island Children’s Museum, Staten Island Mental Health Society, the YMCA, United Activities Unlimited, and the Universal Temple of the Arts. Over 2,300 tickets were sold for the First Annual Touch-A-Truck event, raising over $17,000 for the Staten Island Children’s Campaign. The Staten Island Yankees would like to thank the following companies for their support: The Staten Island Advance, AFL-CIO, Spectra Energy, Manfredi Auto Group, Verizon, Atlantic Express, Scaran Heating, Staten Island Towing and all of the non-profit organizations that are part of the Staten Island Children’s campaign. We are looking forward to next year’s event! 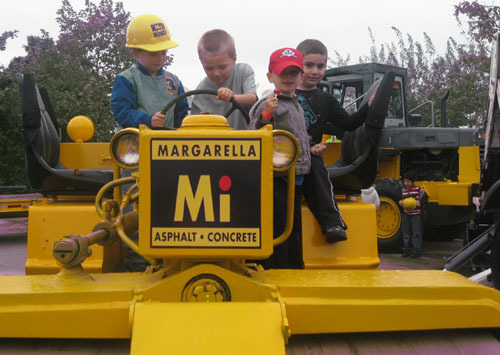 Kids of all ages enjoyed the trucks and activities at the First Annual Touch-A-Truck event. PULASKI, VA – The Pulaski Mariners, the Pulaski County Chamber of Commerce and LewisGale Hospital – Pulaski wish to honor the Bike Virginia participants by starting a “100 Bike Giveaway” donation to benefit local Christmas stores in the New River Valley. The goal is to donate 100 bicycles to children or adults in need. Residents are encouraged to donate new and used bikes that will be divided between each of the Christmas Stores of the New River Valley. 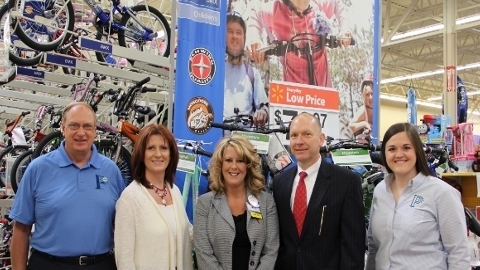 Walmart stores in the region have taken the initiative of donating the first 10 bicycles to the “100 Bike Giveaway”. The Walmart stores of Wytheville, Galax, Christiansburg, Pearisburg, Stuart, and Martinsville have each generously donated a bike. And the Walmart stores of Dublin and Fairlawn have each donated two bikes. Cash donations are also welcomed and can be made out and sent to the Pulaski Christmas Store, P.O. Box 2464 Pulaski, VA 24301. The Pulaski Christmas Store will be the coordinating charitable recipient and donations may be tax deductable. Cash donations can also be sent to any of the three title sponsors of the “100 Bike Giveaway”. In general, a $50.00 donation is sufficient to buy a new child’s bicycle. The deadline to donate bikes for the “100 Bike Giveaway” will be on Friday, June 24th, 2011. Bike totals will be announced at Calfee Park on June 25th before the Pulaski Mariners take on the Princeton Rays at 6:00 pm. Bikes may be dropped off at the Southwest Times, the Pulaski County Chamber of Commerce, or Calfee Park during regular business hours. For any questions about the “100 Bike Giveaway”, please contact Peggy White at 540-674-1991 or Abby Lyman at 540-980-1070. This article originally appeared on the official website of the Pulaski Mariners. Click here to view the original story. SPRINGDALE, AR – The Northwest Arkansas Naturals will honor the commitment of those who have served and continue to serve this country when the team holds Salute to Armed Forces Night on Friday, Jun. 3 when the team takes on the Frisco RoughRiders at Arvest Ballpark. For this game, the Naturals will expand their military discount to provide buy one, get one free tickets to anyone who presents a valid Military I.D. at the ballpark’s ticket office. This discount is based on availability and cannot be combined with any other ticket offer. Leading up to the start of the game, the Naturals will recognize the efforts of military members with an on-field ceremony. As is the case on each Friday night, post-game fireworks will follow the evening’s 7:00 contest. The Northwest Arkansas Naturals are the Double-A Texas League affiliate of the Kansas City Royals and play at state-of-the-art Arvest Ballpark, located in Springdale. The Naturals have a toll-free ticket hotline (1-877-444-2637) for fans to purchase Naturals tickets. Our website, nwanaturals.com offers fans the opportunity to purchase tickets online and avoid lines at the ticket windows by printing their tickets at home or at the office. This article originally appeared on the official website of the Northwest Arkansas Naturals. Click here to view the original story. The Bowling Green Hot Rods, Class-A affiliate of the Tampa Bay Rays, were pleased to host the first annual Relay For Life Night at Bowling Green Ballpark on Friday, May 13th. In conjunction with the local American Cancer Society, the Hot Rods reached out to local Relay For Life teams and presented them the opportunity to not only fundraise for ACS, but also the chance to enjoy a ballgame, be honored on field pre-game and share their personal stories with fans. Relay For Life is an over-night event hosted across the country that celebrates survivors, honors those who have lost their battle with cancer and all while raising money for the American Cancer Society. Relay For Life team representatives threw out first pitches to kick off the night and participated in a on field check presentation. Over 700 Relay participants were on hand for the festivities. 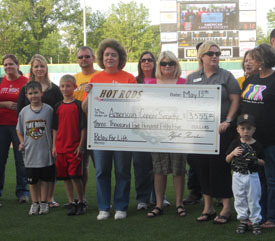 Through the fundraising program with the Hot Rods, over thirty Relay For Life teams from four separate counties raised $3,580 for the American Cancer Society. The Akron Aeros were delighted to aid Hale Farm and Village in their yearly gardening and grounds preparation, Wednesday, May 11. The Aeros traveled just a few miles north of Canal Park to the Western Reserve Historical Society’s Hale Farm and Village, an outdoor living history museum, reflecting Northeastern Ohio life of the mid-1800’s. Upon arrival, the Akron Aeros office staff was split into groups, cleaning and weeding lines of oak trees and the village’s vegetable garden. Equipped with shovels, buckets and gloves, the staff enjoyed getting their hands dirty and soaking up the sunny May day. While touring the village the staff also had the chance to witness live historical re-enactments performed for local elementary school children. “It was a great opportunity to contribute at Hale Farm. It’s such a unique place for the community to visit and learn about history right before their eyes. We were proud to assist in some way so that the community can continue to take advantage of all Hale Farm has to offer,” Aeros Suites, Picnics and Community Relations Coordinator NICOLE BLUM said. As part of the “Helping Hands Program,” the Aeros volunteer at a local charity each month in order to reach out to the Akron-Canton community. Next month, the office staff will volunteer at the Salvation Army. Dan Foust, Assistant General Manager, Media and Marketing, takes a break from gardening to smile for the camera. Aeros’ office interns David Dugan and Jason Thomas collect weeds for removal. The Stockton Ports and District 8 Little League hit a home run yesterday, May 12, after hosting the first Challenger Little League game at Banner Island Ballpark. Participants from the Special Children’s Sports League took to the diamond Thursday with the Stockton Ports players for what some might say the highlight of their little league careers. At the end of the game, everyone gathered together for a big group photo and autographs from the Ports players. This gave all the parents and families the opportunity to snap a few photos of their children with the Ports and mascot Splash. A special ‘thank you’ to Dee Dee Martinez, District 8 Little League Administrator, for helping put the event together. 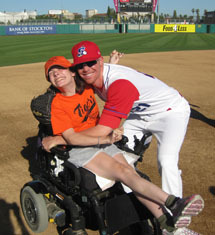 Ports pitcher AJ Huttenlocker hangs out with one of his biggest fans. 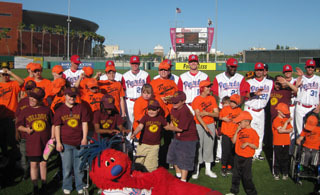 Group shot with Ports mascot Splash. On April 29th, in recognition of Earth Day 2011, National Grid along with 50 members of the Staten Island Yankees and Staten Island Chamber of Commerce spent the day restoring the Alice Austen House in Rosebank. The Staten Island Yankees staff and mascot Scooter – The Holy Cow painted fences, while other volunteers cleaned up the beach area and removed trash and weeds from the area around one of Staten Island’s historic landmarks. This year, National Grid participated in the “Billion Acts of Green” movement by sponsoring 12 community events that will display the Power of Action by helping restore and conserve the environment in their local communities. Staten Island was fortunate enough to be one of the company-wide community Earth Day events that took place throughout New York and New England. All the volunteers wore Power of Action T-shirts, which were designed by elementary school students who participated in an Earth Day art contest sponsored by National Grid and the Green Education Foundation. Scooter - The Holy Cow, Joe Rende of National Grid and Joe Riccutti of the Staten Island Yankees roll up there sleeves to get some painting done. The Albuquerque Isotopes’ first celebrity softball game turned out to an immense hit, as around 30 celebrities ended up raising $10,000 for YDI in Albuquerque. Billed as “Breaking Bad” vs. “In Plain Sight,” the game featured actors from those two shows as well as others shooting projects in the area, such as Cobie Smulders from “How I Met Your Mother,” and even local luminaries like Mayor of Albuquerque Richard J. Berry. Each roster also featured a number of local news celebrities including Dean Staley and Jessica Garate from KRQE 13, Jeremy Jojola from KOB 4, Chief Meterologist Joe Diaz from KOAT 7, and Nikki Stanzione and Kristen Van Dyke from New Mexico Style on KASA Fox 2. Assorted radio personalities TJ Trout (94 Rock), Buck, Dex and Baxter (104.1 The Edge), Jeff Siembieda (610 The Sports Animal) and Albuquerque Journal Sports Editor Randy Harrison also took part in the fun. Voice of the Isotopes Robert Portnoy and Myles Copeland from Big I 107.9 served as emcees. Team “Breaking Bad” was managed by three-time Emmy Award winner Bryan Cranston, while the “In Plain Sight” side was helmed by the star of that program Mary McCormack. In the end, it was McCormack who ended up pulling all the right strings, leading the “In Plain Sight” team to an exciting 5-4 win. The real winners, however, were Youth Development Inc. of Albuquerque, which was the recipient of $10,000 thanks to generous support from Wells Fargo. All in all the game featured a lot of fun, a lot of funds, and a ton of smiles from both those participating and those fans watching. 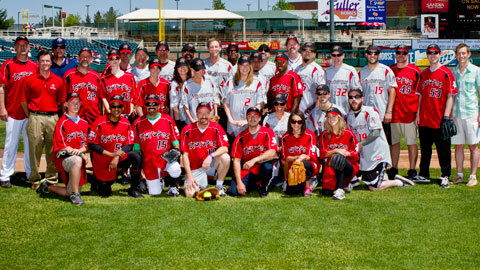 Over 30 celebs took part in the Isotopes’ celebrity softball game benefiting YDI. This story was originally posted on the Albuquerque Isotope’s website. Click here. Prior to the game on Sunday, May 8th the Wisconsin Timber Rattlers paid tribute to the mothers in attendance in various ways. In the weeks leading up to the game the Rattlers offered fans the opportunity to purchase tickets to a pre-game brunch that included a very special offer for moms. Their brunch and game tickets were complimentary with a paid guest. Nearly 300 fans took advantage of the Mother’s Day brunch offer. Upon arrival to the ballpark mothers attending the brunch were escorted by players to the pavilion where brunch was being served. When guests checked in they were offered the opportunity to purchase tickets for a raffle, which was exclusive to those attending the brunch. Each mom received two complementary tickets for the brunch and had the option of purchasing additional tickets. Some of the items in the raffle were a team autographed pink bat, team autographed ‘pink’ jersey, Timber Rattlers merchandise, Brewers tickets and Seroogy’s Chocolates gift certificates. The menu included mimosas, typical brunch items and sweet desserts. The tables were decorated with mini chocolate gift boxes and tribute cards written by players to their moms. Regina (Reggy the Purple Party Dude’s mom) was a special guest at the brunch and was on-hand throughout the game that day to help honor moms in attendance. 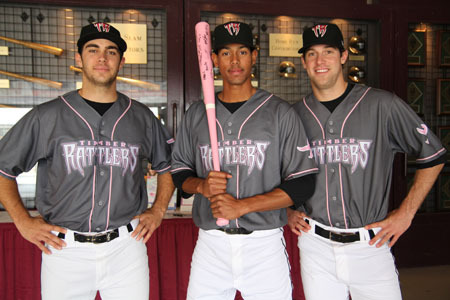 During the game Timber Rattlers players and coaches wore ‘pink’ jersey which fans could bid 0n via silent auction up until the 7th inning. After the game the players were available to autograph the jerseys for the winning bidder. At the end of the day $1,447 was raised and donated to the Susan G. Komen Foundation, dedicated to education and research about causes, treatment, and the search for a cure. Pirates Extending Spring Training Players Go Bowling For Great Cause! Pirates Extended Spring Training players partnered with The Moyer Foundation at its 1st Annual Celebrity Rock n’ Bowl Charity Bowling Tournament on May 7th, 2011. Proceeds from the bowling tournament benefit Camp Mariposa, a program designed to help meet the needs of children and teens facing the difficult challenges associated with having an addicted or co-dependent family member. Along with the bowling tournament the celebrities and guests had an opportunity to help the Moyer Foundation through a live auction. 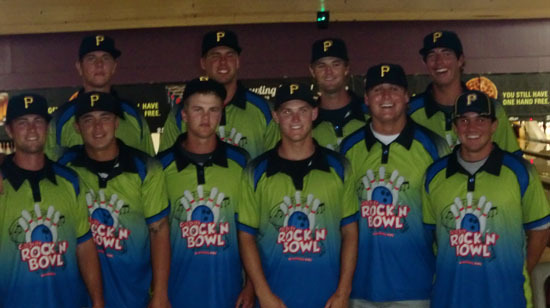 Pirates Extended Spring Training players participated in bowling tournament. The Akron Aeros were pleased to contribute to three worthwhile causes this past weekend. Friday night, the Aeros teamed up with TTR Shipping of Stow, OH, to collect donations for the Alabama Tornado Relief Fund. Aeros fans stepped up donating more than 1,300 items, including clothing, toys, toiletries and non-perishable food items to the cause. These donations helped fill a 53’ tractor trailer that left Akron this weekend en route to Alabama. As part of the team’s Breast Cancer Awareness Day, the Aeros wore special pink jerseys on Mother’s Day. Throughout the game, fans had the opportunity to bid on game-worn jerseys of the entire roster with proceeds benefitting Relay for Life. Aeros fans raised more than $2,800 for the continued search for a cure for cancer. Following Sunday’s Aeros game, the local Challenger baseball leagues of Barberton, Canton, Tallmadge, and Tuscarawas County played a game at Canal Park. Challenger Baseball provides children and young adults from ages five to 22 with special needs the opportunity to play baseball. Aeros front office members, players and coaches participated in Sunday’s event with the challenger participants, by helping them run the bases and field ground balls, as well as signing autographs and posing for a team photo following their game. The Akron Aeros also donated autographed merchandise to the Barberton Challenger League to raise funds for the State Tournament they are hosting in July. The silent auction raised nearly $500 for the tournament. “We had an amazing weekend at Canal Park and Aeros fans showed heart-warming generosity in support of those in need. The Aeros would like to thank those fans who brought items to donate to the Alabama Tornado Relief Fund and those who contributed to Relay for Life. Our entire front office staff and players enjoyed hosting the Challenger Baseball group and hopefully created some fantastic memories for all participants,” Aeros Chief Operating Officer JIM PFANDER said. The Bradenton Marauders, the Class-A affiliate of the Pittsburgh Pirates, held its annual Education Day on April 25th at 10:00am for the students of Manatee County. Over 920 students participated, enjoying a beautiful day of baseball while having the opportunity to learn at the ball park. Marauders Education Day was a success, with the help of local vendors including Mixon Fruit Farms, Mote Marine Laboratory, South Florida Museum, Manatee County Substance Abuse Coalition and Manatee County Library, who set up educational stations inside the ball park during the game. 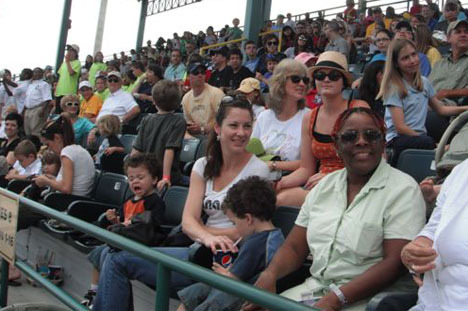 Along with the local vendors, the Bradenton Marauders established three interactive education stations; a math, geography and language table, each bringing an educational approach to baseball. The math station taught students how to calculate ERA and batting averages, the geography table displayed a world map pinpointing the hometowns of each of the Marauder players and Marauder language table depicted English words found in baseball and their Spanish translations. Students cheering on the Marauders! Teachers dancing for their dessert!